Sometimes there’s nothing better than a big beefy burger. With caramelized onions, sauteed mushrooms, and a thick slice of cheddar cheese. But if you’re looking for a healthier alternative, look no further. 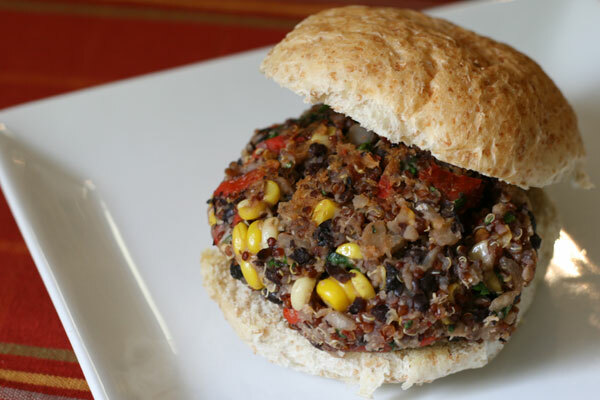 This quinoa burger far surpasses any other vegetarian burger I’ve tried. It’s full of flavor and has a nice spicy kick — thanks to roasted red peppers, chipotle peppers, and chopped fresh cilantro. 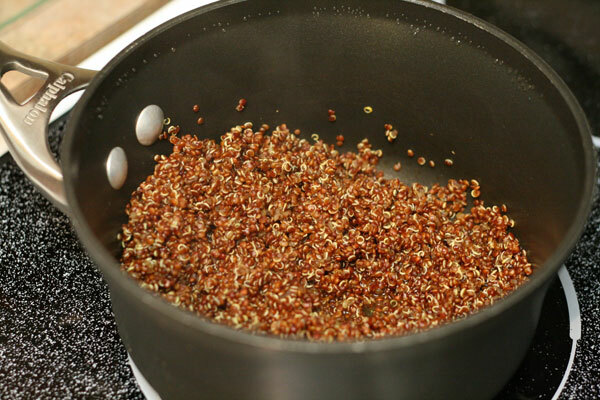 Hearty red quinoa replaces beef as the protein component, and it’s also gluten-free and a good source of dietary fiber. If you’re not yet on the quinoa train, it’s time come aboard! Finally, mashed black beans and cooked yellow corn add substance. The only downside to this burger is that it doesn’t hold its shape. Simply add an egg if this concerns you. Or just scoop up the extra pieces with a fork! Are you a fan of veggie burgers? If so, what ingredients do you use? Combine quinoa and broth in a saucepan, bring to a boil. Reduce heat and simmer, covered, until quinoa is tender, about 15 minutes. In a bowl, slightly mash the black beans. 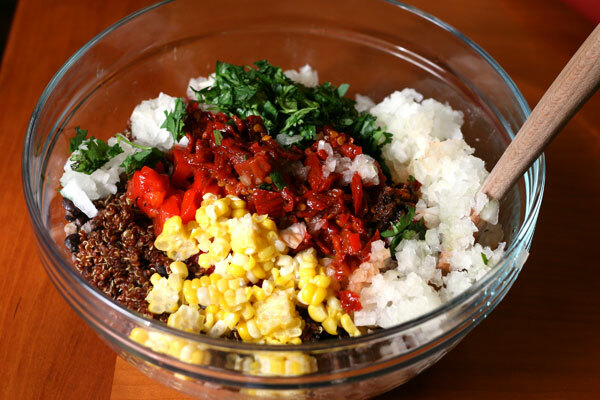 Add the remaining ingredients, including cooked quinoa, and chill for at least 2 hours. Shape mixture into 6 patties. Add a bit of olive oil to a frying pan and brown the patties, about 3 minutes per side. Serve on a hearty bun with your choice of toppings and condiments. YUM! I’m trying to get my meat-loving husband to agree to a meatless night. I would love to make these burgers! Love it! I just made lentil patties and quinoa sliders are slated for later this week. this looks like a great meatless monday meal! ok, why am I hearing/reading about Quinoa everywhere? I don’t even know what it is and I’m so curious!